“If we are to go forward today, we’ve got to go back and rediscover some mighty precious values that we’ve left behind.” —Reverend Martin Luther King Jr. When we talk about uninsured kids, dozens to a classroom, being taught by teachers with no expertise in their field; about mass incarceration with no rehabilitation; about real estate brokers or employment firms that continue to discriminate into the twenty-first century; about housing programs that reinforce segregation and fail to connect willing workers with the employers who need them, we are mainly talking about failures of opportunity. Contrary to popular belief, opportunity in America is in crisis. Class mobility is at an all-time low, the wage gap is through the roof, and Horatio Algers are few and far between. 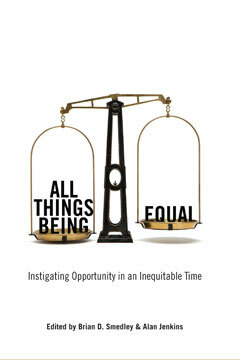 This and other critical ideas about the state of opportunity are documented in All Things Being Equal, a smart new book from a smart new outfit whose mission is to increase opportunity for all Americans. Half critique, half all-important road map for the future, All Things Being Equal includes eight original essays by top-notch thinkers pointing to areas in American life where opportunity is missing and showing us how to instigate it. Linda Darling-Hammond, “Educational Quality and Equality: What It Will Take to Leave No Child Behind"
Brian Smedley is co-founder and executive director of the National Collaborative for Health Equity.